Vida bed and breakfast travel guide for romantic, historic and adventure b&b's. 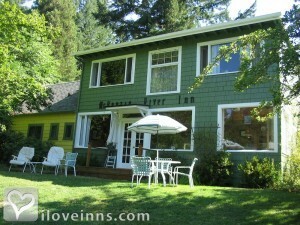 Browse through the iLoveInns.com database of Vida, Oregon bed and breakfasts and country inns to find detailed listings that include room rates, special deals and area activities. You can click on the 'check rates and availability' button to contact the innkeeper. You will be surprised at how peaceful Vida really is. What makes it come to life though are not the hectic activities of people but the cacophony of sounds that can only come from Mother Nature, because you don't have to go anywhere to catch a glimpse of the rivers and tranquil ponds. Vida bed and breakfast are themselves situated in locations that the community is most proud of. Some of these lie just at the banks of the McKenzie, which is a river that passes through Vida. By McKenzie River Inn.